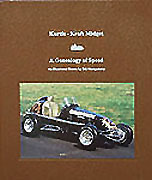 This first book details the history of the Kurtis Kraft Midgets by serial numbers. From midget production from 1945 to 1953 is covered. The history of over 250 midgets with 190 serial numbers are in this book.